Lawmakers squabble after Democrat demand for Trump tax returns: Oversight or presidential harassment? Lawmakers squabble after Democrat demand for Trump's tax returns. In the wake of a Democratic request to the IRS to obtain copies of six years of President Trump’s personal and business tax returns, Republicans are charging that Democrats are taking presidential harassment to a new level in a move that amounts to sour grapes after Attorney General William Barr reached anticlimactic conclusions from the Mueller report. “The Democrat agenda is still strictly focused on harassing the president and trying to make political statements, as opposed to trying to solve real problems,” House Minority Whip Steve Scalise, R-La., told reporters Thursday. Across the aisle, House Speaker Nancy Pelosi contended that “the law is very clear” that the president’s returns are subject to congressional review, reading the text of the law from U.S. code to reporters at her news conference. 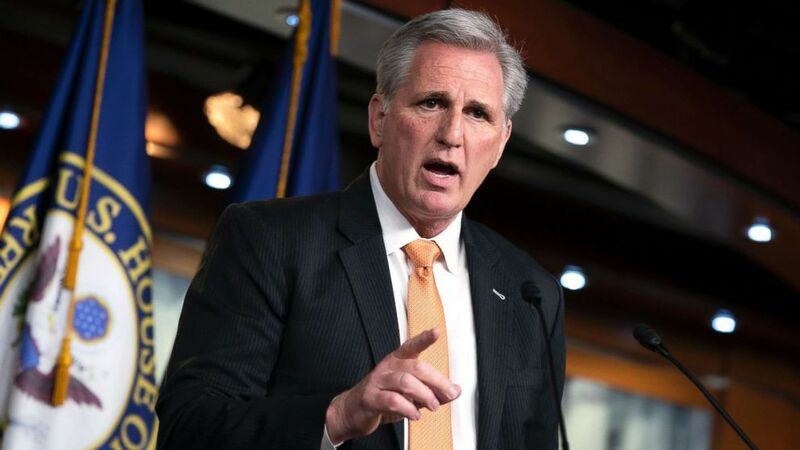 (J. Scott Applewhite/AP) House Minority Leader Kevin McCarthy meets with reporters on Capitol Hill in Washington Feb. 28, 2019. One other lawmaker empowered to request Trump’s tax returns, Senate Finance Chairman Chuck Grassley, asserted that Democrats are seeking Trump’s tax returns, not to reform any tax-related law, but to take down the president. The top Republican on the House Ways and Means Committee forcefully pushed back on Democrats' request, warning the move weaponizes the tax code. Sen. Ron Wyden, D-Oregon, the top Democrat on the Senate Finance Committee, called on Treasury Secretary Steve Mnuchin to have no involvement in responding to Neal’s request, arguing it would amount to "blatant political interference" of the request sent to the IRS commissioner. The statute Democrats are relying on, however, specifies that "the Secretary…shall furnish" returns to the relevant congressional committees. Considering Trump is not bound by law to release his tax returns himself, Scalise stressed that Trump has complied with current law through financial disclosures. Rep. Dan Kildee, a Democratic member of the Ways and Means committee, stressed he expects the IRS commissioner to follow the law and fulfil the chairman’s request. Neal has set a deadline for the IRS commissioner to respond by April 10, which Kildee said shouldn’t be a heavy lift because “these are returns that have long since been filed.” If the IRS does not comply, Neal could escalate the showdown with a subpoena. House Democrats haven’t stopped at Trump’s business filings. On Wednesday, the House Ways and Means Committee formally requested six years of Trump’s personal and business tax returns, amid a monthslong pressure campaign from progressives.